YSWARA is exploring meaningful collaborations with big and small brands and influential artisans. As an advocate of contemporary art & design, YSWARA enters into creative cross-pollinations with artists & brands that share a similar ethos. Such collaborations are essential, as they: create a social discourse around the various artisanal issues affecting Africa, allow for a creative interpretation of the continent and offer a platform for an imaginative & explorative participation of African brands. The collectible canisters offered a cylindrical canvas for Aguessy, will encompass the opus of the artist’s innovative design and message. The design, titled ‘Aye’, a Yoruba word ‘which means life’, embeds a message of life and ‘togetherness through greatness and building.’ Aguessy’s creative inclinations toward humanity, the importance of culture and the influences of time, offer a befitting expression of YSWARA’s pursuance towards propelling African culture and tradition for posterity, though its tea narratives. About: Aguessy (1977-2017) was the first African designer to have a permanent division devoted to his work, in a French arts museum - Beauboug Museum. In addition to collaborating with Stella McCartney, Agossi has worked with Cartier and Yves Saint Laurent, to name a few. Kossi Aguessy, a well-known name often echoed in the halls of some of the most prominent exhibitions in Europe, developed a passion for design from as early as three years old. Having completed high school at thirteen years old, his creative curiosity could only grow stronger when he ventured to London on a scholarship to the renowned Central Saint Martins, University of the Arts. We joined creativity with the iconic South African designer MARIANNE FASSLER to create a candle in support of ORANGE BABIES, a charity whose ultimate aim is to achieve an HIV-free generation in Africa. About: Marianne Fassler has spent over three decades in the fashion business. She operates from Leopard Frock, her creative workshop in Saxonwold, Johannesburg. She sells garments and separates off the peg and also consults with individual clients by appointment. Her work is superbly crafted, interesting and comfortable. 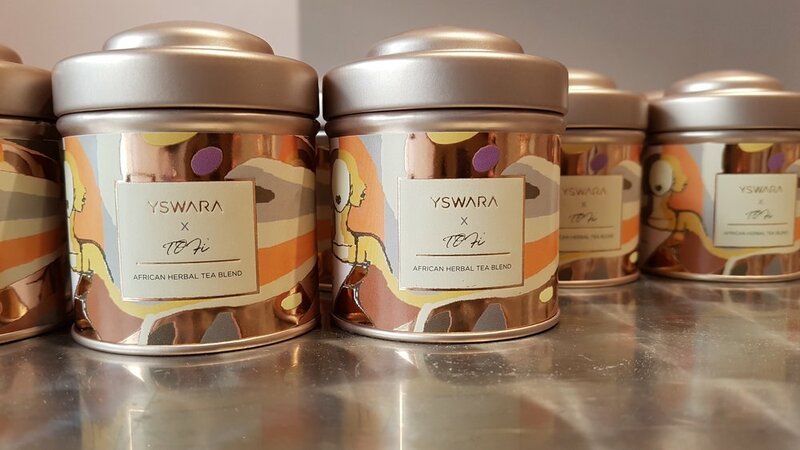 Yswara joined forces with TERRES D'AFRIQUE, creator of African plant-based beauty products, to create an exquisite new range of wellness teas. The partnership was an easy fit from the start. Both YSWARA and Terres d’Afrique are committed to the creation of extraordinary, socially responsible experiences with a proud African heart. The collaboration between the two brands is a meeting of minds. Both brands share the same philosophies, values and passion for Africa. Attention to detail, the uniqueness of the recipes, the high quality of the ingredients we use and of course our shared passion for social responsibility are common threads between YSWARA and Terres d'Afrique. This collection catered for all states of mind and embodied a shared admiration for the age-old benefits of tea and the healing powers of plants found in the African wild. About: The house, in the neighbourhood of Orchards in Johannesburg, was the home of Mohandas Gandhi from 1908 to 1909. It is during the 21 years Gandhi spent in South Africa, from 1893 to 1914, that this timid young man who had just passed the bar examination became the man who would inspire the world with his Satyagraha philosophy. LALESSO invited 10 African brands to create 10 products to celebrate their 10 years anniversary under the themes of sustainability, Africa and summer. We are honored and grateful to be part of this important milestone. The Lalesso x Yswara collaboration is a tea and candle set adorn with scarabs symbols of rebirth and regeneration, a notion felt strongly within the theme of the anniversary. The giftset is a tea and candle set; featuring “Askia of Songhai” a blend with summer inspired notes of Rooibos, Pineapple and Kola Nut. The packaging features luxury custom Lalesso printed packaging with Yswara’s signature rose gold foiling. Yswara is a socially responsible brand creating extraordinary teas and TOFi is an investment firm focused on improving the lives of women and girls of color globally through intervention and support. Together, with Atlanta-based artist Kottavei this collaboration represents excellence, empowerment, and underscores the value and power that women of color bring to commerce and to the world. Thanks to Andrea Kelmer and Naledi Mabuse , we joined creativity with the very beautiful and soulful brand ARDMORE to create the umSisi Collectors' Tea canister to support ORANGE BABIES, a charity whose ultimate aim is to achieve an HIV-free generation in Africa. 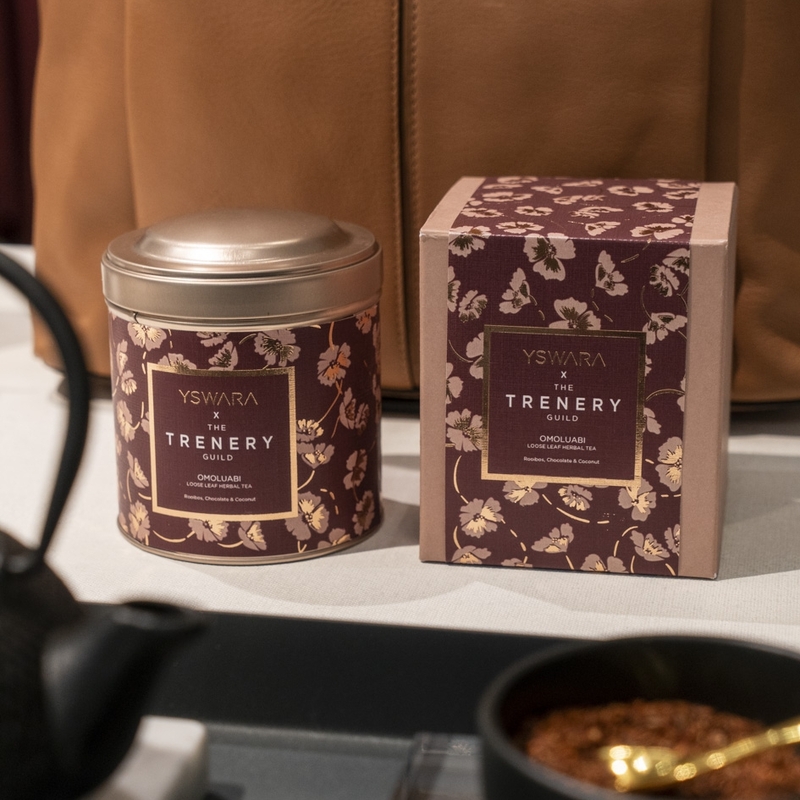 Working alongside the Trenery Senior Textile Designer, Swaady has created a sensory invocation of the A/W design – made from a rooibos base with warm chocolate, coconut and mocha overtones. The flavours echo the luscious colour palette and swirling paisley motif of Folkloric Spice, giving customers the opportunity to imagine the various elements that come together in the rich, warm pattern. 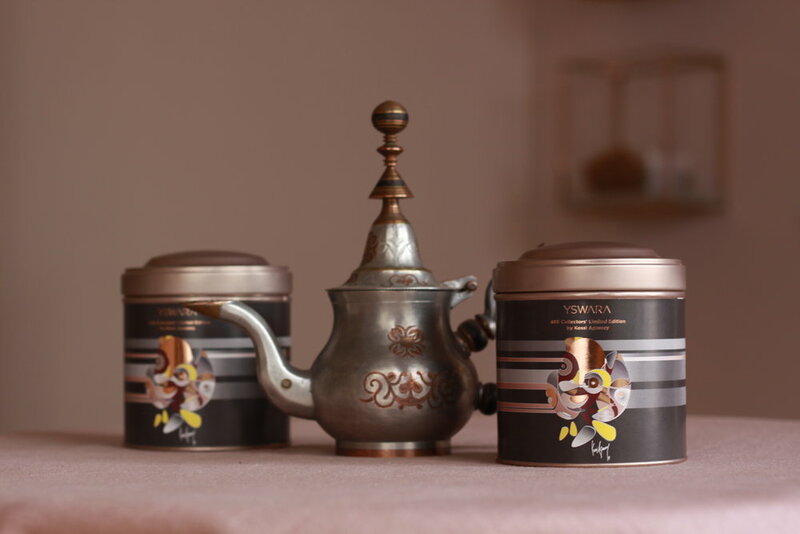 Additionally, a floral print within the Folkloric Spice range has been reinterpreted and applied to the unique Trenery Guild x Yswara tin and box packaging. Together, Swaady and Senior Textile Designer, Bree Dhaliwal, played with colour and graphic elements to create the exclusive tea pattern, adding another layer to the collaboration and the Trenery story.